The Audio-Technica ATR3350iS Omnidirectional Lavalier Microphone is self powered so it can be used with cameras and recorders that do not supply bias voltage (also known as plug-in-power). 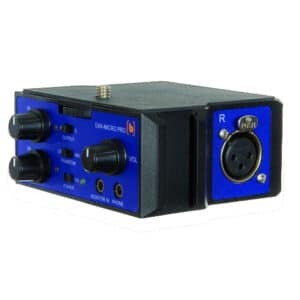 The dual-mono 1/8″ (3.5mm) output plug connects to your video camera, DSLR, or handheld audio recorder’s stereo 1/8″ input, to record audio on both left and right channels. If your camera or recorder has as 2.5mm microphone jack, such as the Fuji cameras, you will need a 3.5mm to 2.5mm adapter. We recommend our Premium microphone over this microphone as this mic has more internal electronic noise (hiss). If your recording device does not supply “plug-in” power, you can use a preamp to provide that power.